1 of 10 In a large mixing bowl, combine water, yeast and molasses. Mix gently until all yeast dissolves. Set mixture aside 5 to 10 minutes, until yeast bubbles and floats to the surface. Stir in salt and 1 cup of the olive oil. 2 of 10 With mixer on low speed, add all-purpose, high-gluten and whole wheat flour. Mix until flour is absorbed and dough pulls away from side of bowl. Roll dough into a large ball and let stand 5 minutes. 3 of 10 Cut dough into 12 pieces. Roll pieces into balls and place on an oiled baking sheet. Brush balls lightly with olive oil and cover with plastic wrap. 4 of 10 If you are using dough right away, let it sit 30 minutes before grilling. If not, it can be stored for up to one day in the refrigerator but it must sit at room temperature for an hour before stretching. 5 of 10 When dough is ready, prepare a grill to medium-hot (preferably charcoal, but gas works nicely too). Make sure rack is set at least 4 inches from fire. 6 of 10 On an oiled piece of parchment paper, stretch out a piece of dough using the (lightly oiled) palms of your hands. If dough is sticking to the surface, lift it and drizzle a little more oil on surface. The dough should be a 12-inch circle and paper-thin. The shape of the dough is not as important as its thickness. 7 of 10 Lift dough with parchment, invert it onto hot spot of grill and peel off paper. Dough will start to rise immediately. After about 2 minutes, carefully lift edge of dough to check color of the underside, which should be an even golden brown. 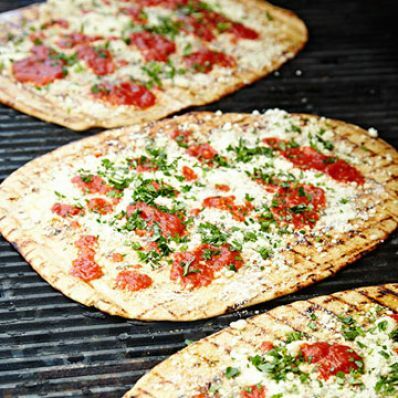 8 of 10 Flip dough over and place it on edge of grate or on a cooler spot of grill. Brush cooked side of dough with olive oil. Combine cheeses in a medium bowl. Evenly spread a scant 1/4 cup of the combined cheese to very edge of dough. Next, with a tablespoon, dollop tomato sauce on pizza (8 to 10 small spoonfuls) don't spread sauce over entire surface. Drizzle pizza with 1 tbsp of the olive oil and sprinkle with 1/2 tbsp of the parsley. 9 of 10 Carefully slide pizza back to edge of hot section of grill, and rotate until bottom is evenly golden brown. It should take 3 to 4 minutes. Do not put pizza directly over fire, or the bottom may burn before the cheese melts. 10 of 10 Garnish with chopped basil and serve.